Nearly 1/3 online purchases on America’s biggest shopping days, Thanksgiving day and Black Friday, happened on mobile devices. The recent Holiday Benchmark Data Alert by IBM mirrors this trend. Online sales over the holiday period went up by 13.9% in 2014. Of these online sales, 22.6% were thanks to mobile, an increase of 27.2% from the previous year. And perhaps more interestingly, over this period of mass spending, mobile traffic accounted for 45% of all online traffic, an increase of 25.5% from 2013. Believe it or not, on Thanksgiving Day itself, online traffic from mobile devices was higher than on traditional PCs, taking 52.1% of the online shopping pie. Based on data from over 100,000 Shopify stores, mobile now accounts for 50.3% of all Shopify's e-commerce traffic. Considering way that smartphones and tablets have quickly evolved over the past few years, it’s no surprise that this holiday period has demonstrated an increase in online shopping on mobile. 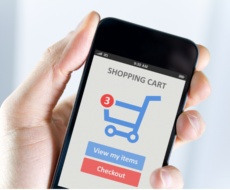 For one thing, shopping on mobile devices has never been easier. For another, easier is all it’s going to get. Retailers, businesses, and marketers not making the most of these mobile channels are truly missing out. Of course, there’s still the problem of getting products and services in front of people browsing their iPhones or Androids, looking for ways to spend their cash. The stats themselves don’t placate this issue; they simply draw a picture of how people are buying stuff online. It’s no secret that reaching people through mobile devices is more difficult than it is through laptops or desktops. It’s a fact that has been driving mobile marketers mad ever since the mobile phone became internet friendly. SMS are opened 97% of the time, and 91% of those 97% are read within three minutes of receipt. Short URLs can be embedded into a text message, too. Which means that a simple SMS can lead a potential customer to any sort of content you wish them to see. Whether you want people to access your online store, a YouTube video, an audio podcast, a rocking blog post you’ve written, an app download, a discount coupon you’re offering for a limited time, or whatever else – it doesn’t matter. An SMS opens a gateway to get them there. Quickly. Easily. Without costing you an arm, or a fourth mortgage. It’s true that almost all smartphones are email friendly. Reaching people through email, and then getting them to click through to wherever it is you want them to go, however, isn’t so easy. Even a roaring eDM campaign that has a 40% open rate and say a 50% CTR, still doesn't even come close to touching the effectiveness of SMS. SMS is one of, if not the easiest ways for communicating information from one device to another. And it's difficult to see this changing in at least the near future. It's one of the quickest, cheapest, and easiest ways to open up the horizon to your mobile marketing initiatives. If targeting people while they're on the go is something that sits high up on your priority list, SMS remains the leader of the pack, holding the key to worlds of untapped mobile marketing potential.